Happy New Year! 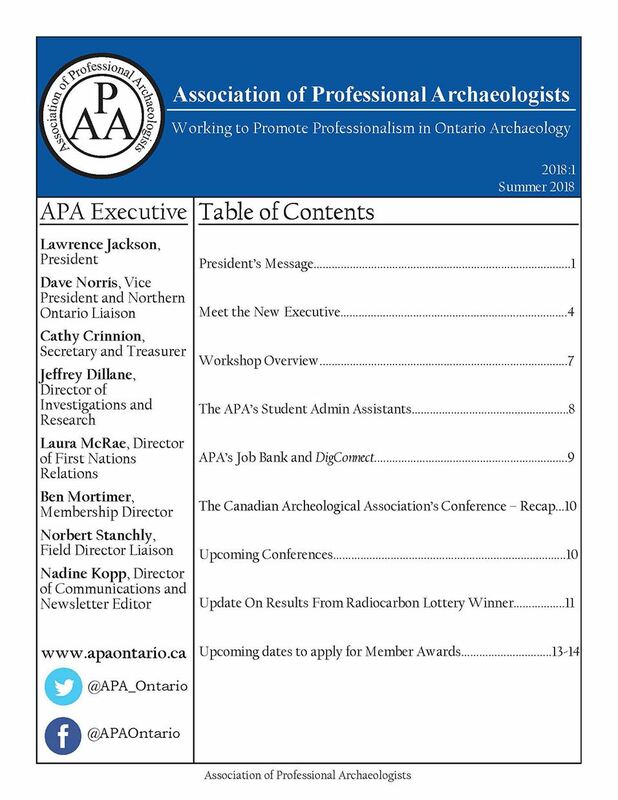 The APA Executive members are pleased to congratulate recent recipients of the Student Bursary and the Radiocarbon Date Merit Award. Many thanks to the APA members who have been donating to the Student Bursaries, and many thanks to A.E. Lalonde Laboratories who provide the AMS C14 analyses for our member awards. To read more about these members and their research, follow the links below. Contact members@apaontario.ca if you have a sample that needs dating! The Student Bursary Awards have been extended to October 31st, 2018. The Conference Travel Award has been extended to November 30th, 2018. The Radiocarbon Date Award has been extended to December 15th, 2018. Get your applications in for a chance to win! Need information about existing Land Use Planning Tools for your project? One of APA's Student Admin Assistants has combed the internet to see which Land Use Planning Tools have been utilized for each of the Upper Tier, Lower Tier and Single Tier municipalities in Ontario (up-to-date as of Dec.2017/Jan.2018). Start your search in the 'Online Resources' tab.